We’ve been living in our Florida home for the last four months, so it was exciting to move back to Mexico and see the progress on the house. We had hoped the house would have been completed and that we could have moved in. Not so! Marco and his helpers have spent a large portion of their time the last three months reinforcing the foundation. The coming of the rainy season showed that the earth around the construction site was not stable enough and was starting to wash, threatening the integrity of the entire structure. 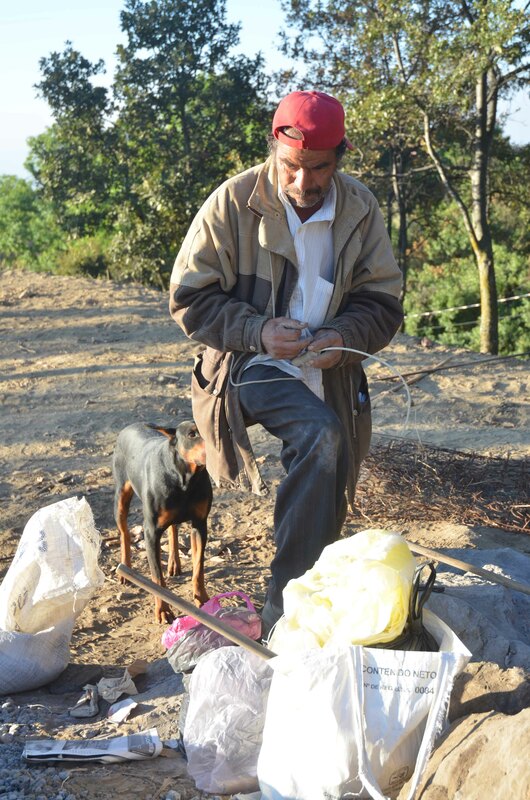 Marco and his men dug and moved earth, adding more concrete to the foundation, all by hand. Now, finally, they are on to the next task of building the form for the main roof so that it can be poured. The east porch roof has already been completed. This delay, though frustrating, was necessary. We wouldn’t have wanted Marco to ignore the serious issue just so he could stay on schedule. With some heavy rains we would have found our house teetering, and probably collapsing. Haste would have resulted in great waste! It’s a lesson for living life as well as building a house; you have to take the extra time and effort to address issues that were not foreseen but that are serious and shouldn’t be ignored. There’s no way we can predict, plot, and plan for every situation. 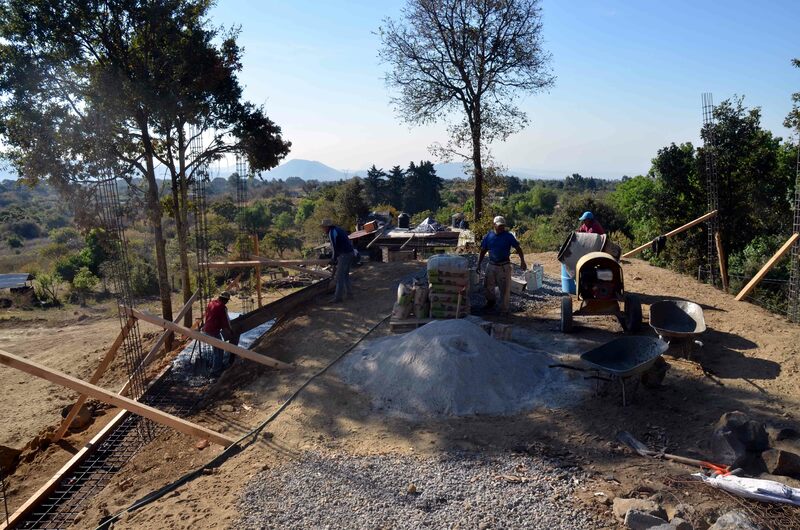 The foundation has been poured and now Marco our builder is laying the brick for the house. It’s a time-consuming process of laying one brick at a time. 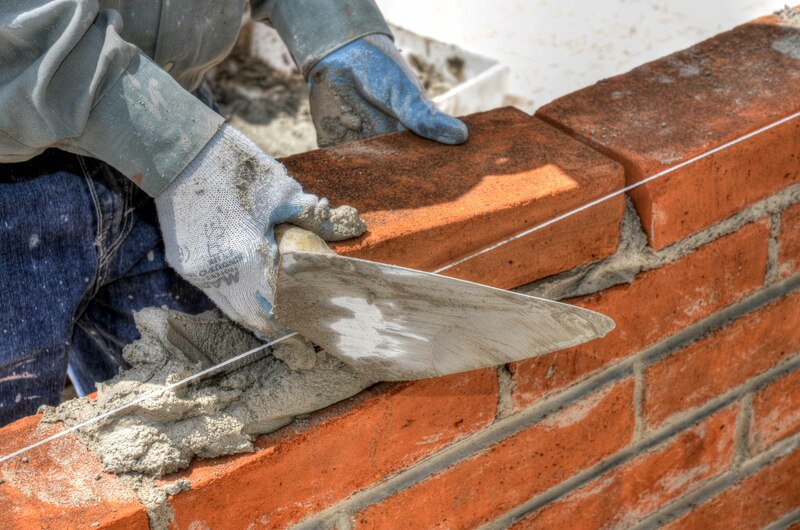 He’s careful to use just the right amount of mortar, seating the brick firmly in the mortar, making sure the brick is in line with the others with the help of a guide string and clearing away the excess mortar; all of this with each brick laid. In the additional photo you can see the stack of brick that has yet to be laid. Eventually the brick will all be in place and the walls of our new home will be complete, and it will have been done one brick at a time. Life is a lot like a brick wall; life is lived one moment at a time, one event at a time, one conversation at a time, one decision at a time, and one day at a time. If our builder Marco decided to get sloppy with laying brick, even with just a few of them, it would ruin the house. So it is with life. If we get sloppy with the seemingly small details of life they will quickly mess up our life in general. Over the years I have counseled many couples whose marriage is in trouble. In every case it wasn’t one big event that brought the marriage to a crisis (not even an affair), but a slow and almost imperceptible drift from treating each other the way a husband and wife should treat each other on a day-to-day basis. Even if there was an affair it likely wouldn’t have happened if the marriage had been healthy. Students who pull an “all nighter” to try and get a good grade on a test when they haven’t been exhibiting good student habits all semester will likely not do well in the exam. You can’t quickly learn what can only be slowly learned. Habits can be good or bad. Both good and bad habits are the same, however, in that they are established over a period of time by making the same decision, thinking the same thought, or acting in the same way over and over again. Yes, life is a lot like building a wall with bricks. The question for each of us is, then, what are we going to do with the next brick? 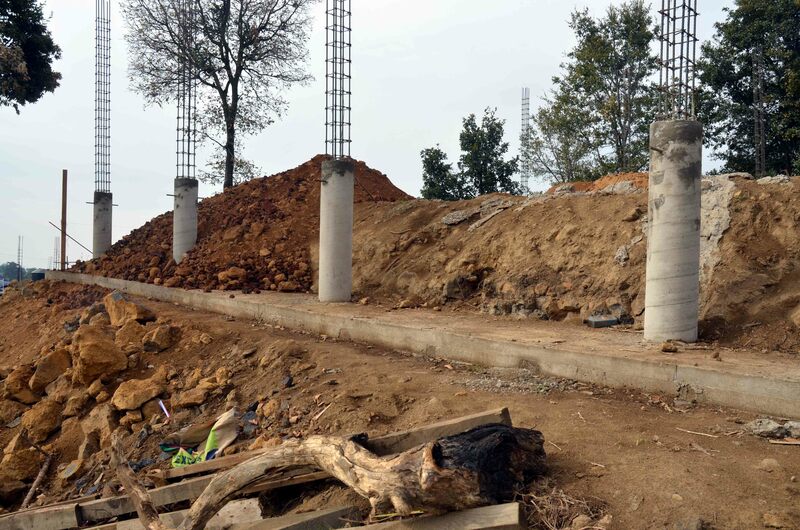 Some pillars have been poured for our house. 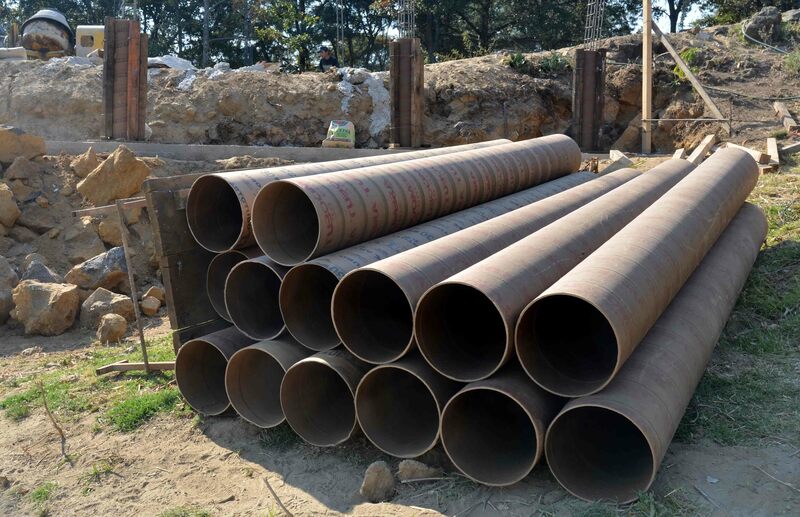 Marco, our builder, purchased some giant cardboard tubes, placed them over lengths of re-bar that had been wired together and attached to a square foundation of re-bar. They then mixed concrete and, one wheelbarrow at time, filled each form. After a day or so of curing, the cardboard forms were peeled away and, whoa-la, we have our pillars! Ten have been poured to hold up the roof and 12 more will be poured to give additional support to the roof and to give the walls of the house strength. That’s 22 pillars in all to support a house of only 736 square feet. Of course the roof is made of concrete ten centimeters thick (about four inches) and that’s a lot of weight. Each pillar will do its job, but it won’t be carrying the whole load. The support of the house is distributed among all 22 pillars. It’s a group effort. We’re all to be pillar people. Each of us is called upon by the Lord to be supportive of those He’s placed around us. Yes, each of us carries a weight of responsibility, but not the entire weight! I sometimes have had to remind myself that God has called me to come alongside people and be a help and a support, but that it doesn’t all depend on me. None of us can do it all, just our part. In His divine providence God will bring other people into the situation to do their part. We’re just called to do our part, to be a pillar person! We saw some concrete advances in the building of our house this week, literally concrete advances, with the pouring of concrete for the foundation of the columns that will hold up the front and back patio as well as the front and back edges of the concrete roof. Marco, our builder, was apologetic the other day about the apparent lack of visible progress on the building project, but he told us (through our daughter Julie interpreting) that he wanted the foundation to be good and solid, so it would hold up the house. We agreed with him that we certainly want a good foundation. Now we watch in these coming days all that which will be built on the foundation Marco put down this past week. The building adventure continues! 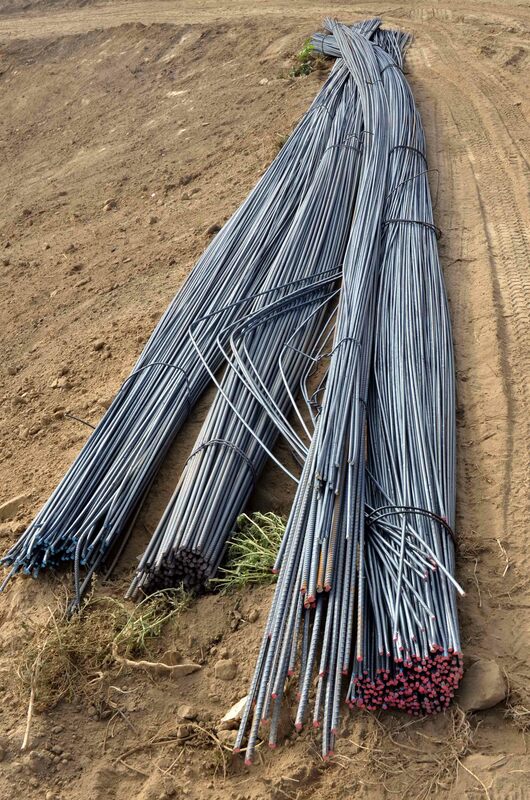 We have a lot of building materials on the property ready to be used for the building of our house here in Mexico. 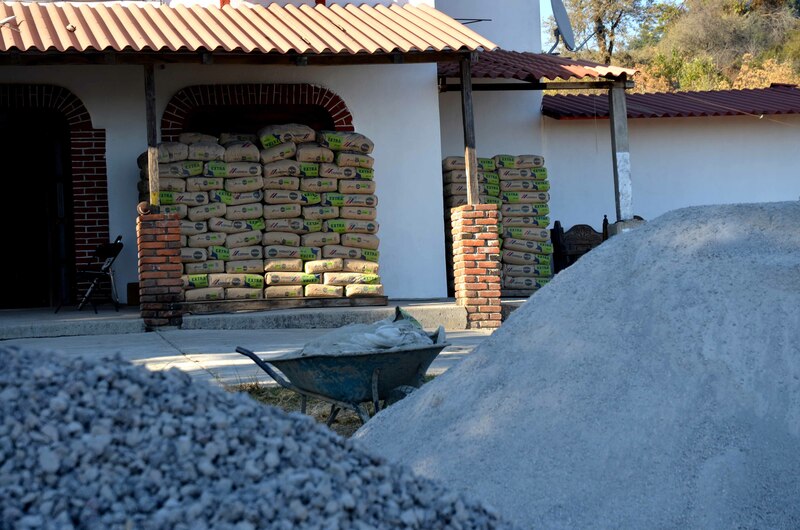 In fact, I’m typing this on the front porch of the Zaragoza house with about 160 bags of cement stacked up behind me. It’s interesting that the cement that’s stacked behind me in bags will soon surround Diann and me in the form of a concrete roof, concrete foundation, and concrete pillars. There’s also a pile of stone and another pile of sand along with bunches of long strands of rebar. God can create something out of nothing, it’s called ex nihilo. We people have to create something out of something. Diann and I are blessed of the Lord that we have the resources, dollars turned into pesos, to purchase the materials needed to build our home. We also have the gifts of our builder, Marco; I certainly wouldn’t want to try and build the house myself! I was thinking about this whole process this afternoon while I was taking a walk, and it occurred to me that God always provides the resources we need to carry out His call upon our lives. He provides the financial resources, the resources of the talents of others, His gifts of specific talents or abilities given to us, the gift of time to do something, the gift of the help of others, and the physical, emotional, and spiritual strength we need. As the old saying goes, God doesn’t call the qualified but qualifies the called. Part of an active faith in the Lord is to believe that He will provide what we need to do what He wants us to do. He is our ultimate source, for everything! Nearing the end of his life, King David, who had yearned to build the Lord’s temple but wasn’t allowed to by the Lord, said to his son Solomon, “I have taken great pains to provide for the temple of the Lord a hundred thousand talents of gold, a million talents of silver, quantities of bronze and iron too great to be weighed, and wood and stone. And you may add to them. You have many workers: stonecutters, masons and carpenters, as well as those skilled in every kind of work in gold and silver, bronze and iron – craftsmen beyond number. Now begin the work, and the Lord be with you.”(1 Chronicles 22:14-16) Let’s begin, or continue, the work the Lord has called us to, believing in His provision for the call! Diann and I returned to Home Depot with Adrian driving, he’s a key worker at the Ranch. The half hour drive from the Ranch to Cuautla is a downhill drive all the way, with the temperature rising by about twenty degrees in the lower altitude. We were able to work our debit cards so we could make the final payment of the supplies, at least this round of supplies. Then we walked around Home Depot dreaming about what we might put in our new home. We also shopped at the nearby Walmart. Lunch at McDonalds might seem to complete the sense that life here isn’t all that different from in the States, but it is. 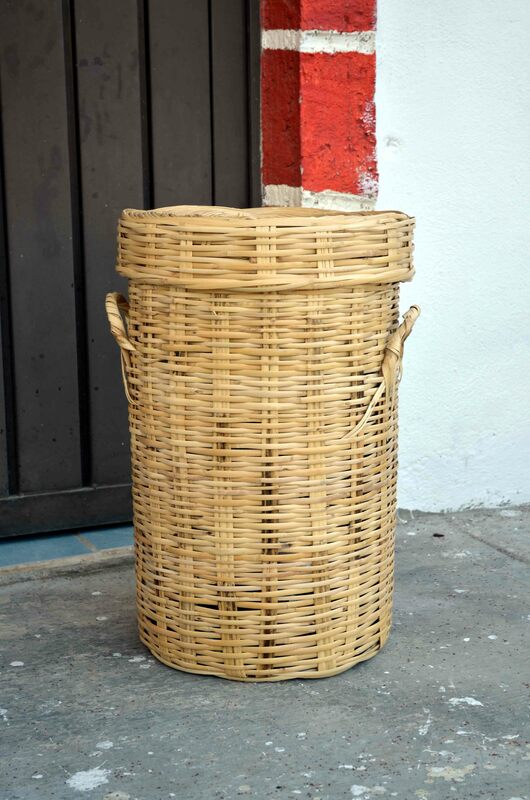 For instance, we decided not to purchase a laundry hamper at Walmart because we had seen a guy along the road selling wicker baskets, so we bought a tall basket from him on the way home that will fit much better esthetically into our Mexican home than a hamper from Walmart made in China. Diann and I have decided that we want our home here to reflect the culture, and not try to make our house a transplanted U.S. house. One exception is that I will NOT drink instant coffee in our new home (most folks here do so), but we will proudly brew Starbucks. Other than this, and a few other concessions that I can’t even think of now, we hope to fit in with the culture. God wants us to be completely present wherever He calls us to be, not holding ourselves back but giving ourselves over to His will and His purposes wherever we are and with whom He’s placed us. 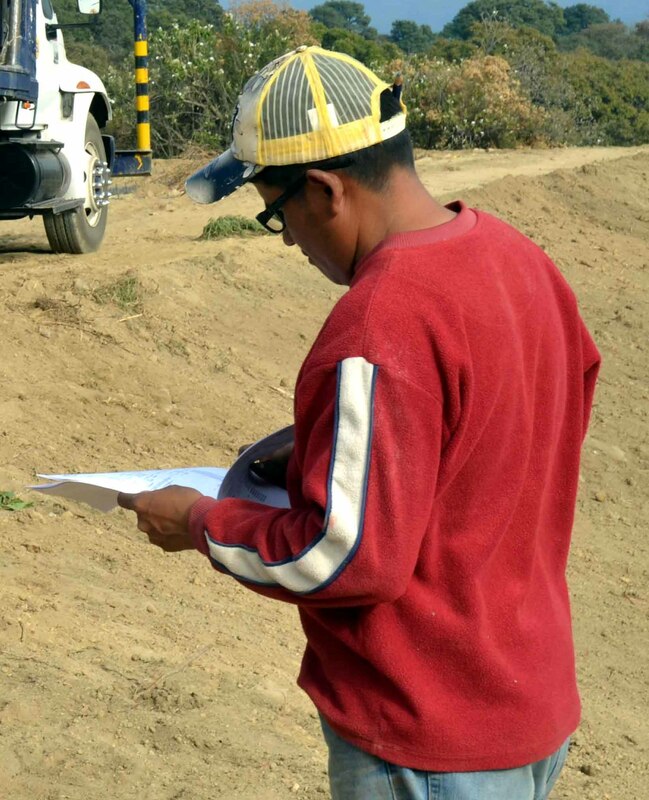 Marco arrived back at the ranch with his own rough drawing of the floor plan and a list of material for us to purchase at the Home Depot in Cautla. My son-in-law Victor drove, I rode shotgun with Marco in the back seat. Because so much construction goes on at Refuge Ranch Victor is considered a contractor and gets some discounts. He has entry to the collection of desks where contractors sit down with the Home Depot folks and spend their large sums of money. This is where we found ourselves, at the desk of a polite young woman named Gaby who was patient, thorough, and was both quick of mind and quick with a smile. It took a while to enter the large order into the computer. We ran into a glitch with paying for it with my debit card; the amount was over our limit. I paid for what I could and said we’d be back tomorrow to pay for the remainder. This would delay delivery of the materials. The Adventure of Building a House in Mexico Begins! 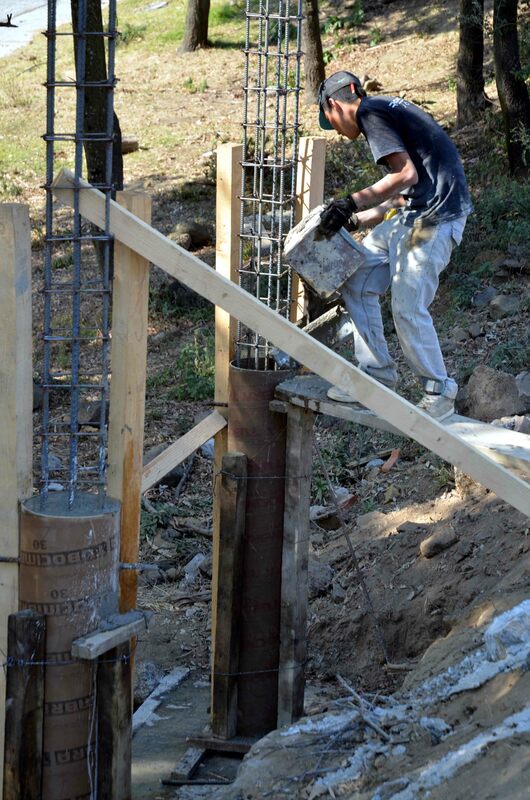 Cirino is the hired man at Refuge Ranch and does much of the construction – he’s a mason by trade. However, there are two building projects going on. 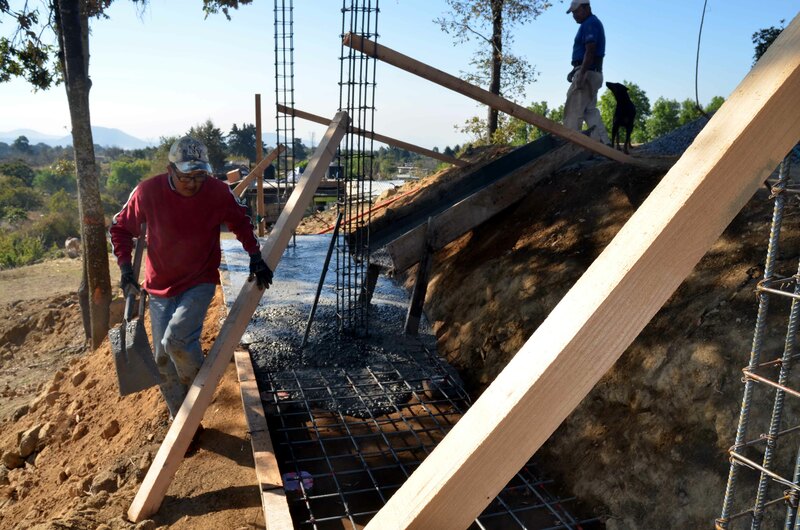 The main new house for the Zaragoza family is ready for some prep and pouring of the foundation and we’re ready to begin construction on our home on the ranch. Cirino suggested a construction worker from his church. Victor and Julie asked him to be here by 7 am, figuring he would show up by 7:30, in the traditional Mexican fashion of viewing schedules as general guidelines and not necessarily to be adhered to in a legalistic way. Surprise! Marco showed up at 7 am, prompt! Marco is average in height, as Mexican men go, and muscular in an understated way. He wears dark rimmed glasses and is quiet and almost timid in nature, but confident enough to give his expert input. I like him. I had created a drawing of the house and shared it with Marco, as best as I could with the language barrier. 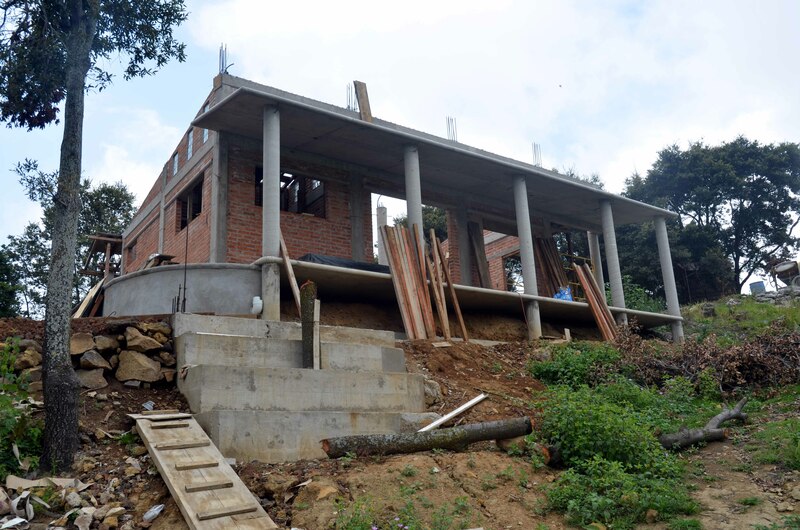 This will be interesting – building a home in a foreign country where I don’t speak the same language as the builder, using the metric system to measure everything, with all wages and materials having the peso as the means of exchange. Add to this the fact that I’m not a construction expert. Other than these few details, building a house here seems fairly doable! Marco will be back at the ranch in the morning. He, Victor, and I will head to Cautla where there’s a Home Depot store. The adventure of building a house in Mexico begins!